Second Amendment Short Sleeve T-Shirt | BUDK.com - Knives & Swords At The Lowest Prices! Display your beliefs proudly and boldly with this Second Amendment short sleeve t-shirt. 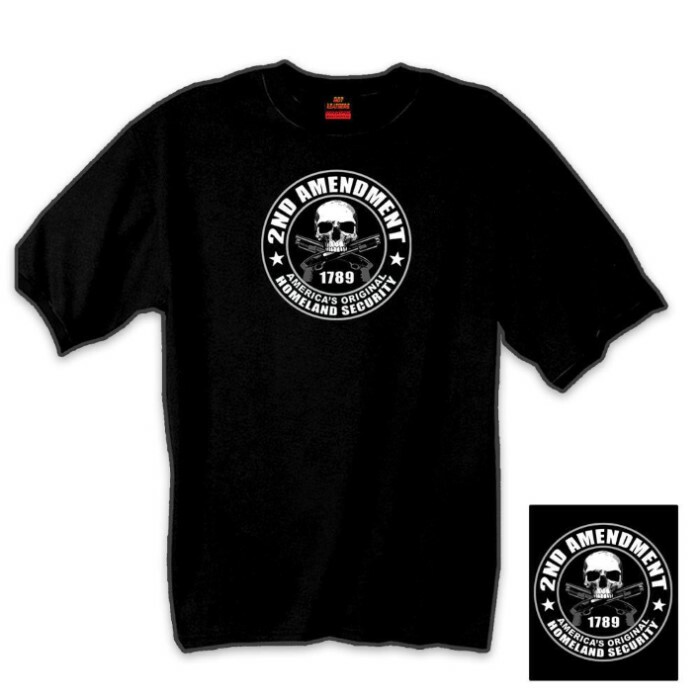 It features a skull and second amendment/homeland security slogan. My father was a career Air Force member. I spent the first 17 years of my life as an Air Force brat. I followed that up with 20 years of Army life. All and anything to do with the military, comments, praise, slogans, whatever..............I know it,lived it, and I believe in it. This is the finest and proudest country on the face of this orb we live in. God bless all who served. My deepest appreciation to those who serve. The check I gave Uncle Sam for the cost of my life was well worth it. Wear it proud, say it loud. All gave some, some gave all. God bless each and every one.